The Worshipful Company of Weavers, the oldest of all the London Livery Companies, can trace its origins to a twelfth-century craft guild. Largely based upon original records never before studied in depth, this authorized history of the company covers the period from the end of the reign of Elizabeth I to modern times. 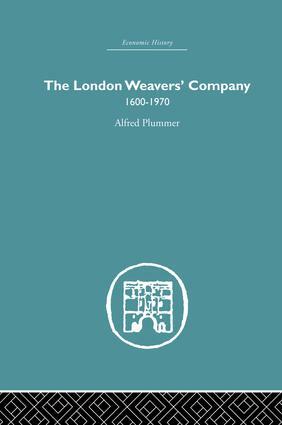 Alfred Plummer presents a portrait of the London Hand-loom weavers in their historical setting, living strenuous lives in an industry which was once essential but has now disappeared. He describes many fascinating aspects of the Company's 'eventful history', from the numbers of apprentices, to their parents and places of origin, the attitude towards the admission of women and the enlistment by the Weaver's Company of the powerful pen of Daniel Defoe. In addition, the work examines the impact of such catastrophes as the Great Plague and the Fire of London. The author deals with the dogged struggle for survival of the famous Spitalfields silk weavers, and explores the part played by the Weavers and their associated London Livery companies in the 'plantation of Ulster' under James I nearly four centuries ago. This book was first published in 1972.